Please Select A Category Below - Thank You. Located in Michigan's Upper Peninsula! 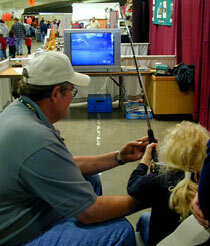 Walleye fishing in the Upper Peninsula of Michigan draws thousands. 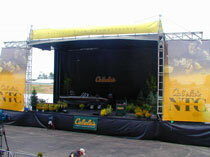 The 2004 Cabela's National Team Championship walleye tournament on the Bays de Noc was held in Delta County. 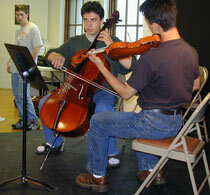 It involved the entire community - Escanaba, Gladstone, and Rapid River. Competitors came from all corners of the country. 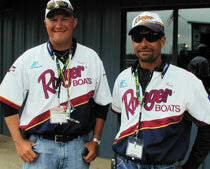 Pictured above is Travis Sanger, Kearney, NE & Kevin Larkins, Greenwood NE. The National Champions took home a prize package totalling over $25,000!! Congratulations goes out to the incredible team Carol & Glenn Chenier of Gladstone, Michigan! The trophy alone is a masterpiece! 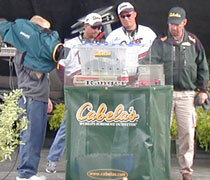 Teams went up to the Cabela's stage for their weigh-in of walleye. Contestants enjoyed two full days of Tournament Action! 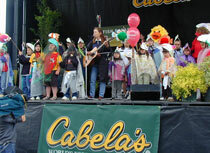 Kitty Donohoe sings with the area youth dressed up as fishies! The Ruth Butler Building was action packed with exhibitors, businesses, raffles, coffee, fish cooking demonstrations, and virtual fishing for the kids!! It was a weekend filled with great excitement and memories. Events included: Trolley Rides, Hot Air Balloon Rides, Pony Rides, Antique Steam and Gas Engine Village, Lumberjack Breakfast, and more! Al Hansen demonstrated the fascinating art of raku clay firing through live demonstrations. 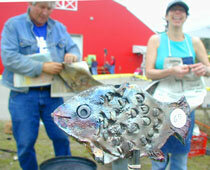 The children and adults were able to select a one of a kind fish to fire and take it home with them. This is an entertaining process with bisque-fired clay pieces, which are then coated in a special glaze and fired in a variety of conductive materials. The results are wonderful! Authors, organizations, and businesses enjoyed meeting up with the crowds and sportsman! Shown above is SGT. John A. Walker with his Tales From A Game Warden! The Escanaba Band played many melodies for the crowds on Saturday! There was music, art, and food to welcome Cabela's and the Bonifas Guests. The grand opening was wonderful and the festivities were spectacular. Exclusive Art Classes were offered for visitors with Sandra Salo - Japanese Fish Printing and John Gustafson - Abstract Watercolor Lanscapes! Click his name to see his art.